Air India is the flag carrier airline of India headquartered at New Delhi. It is owned by Air India Limited, a government-owned enterprise, and operates a fleet of Airbus and Boeing aircraft serving 94 domestic and international destinations. The airline has its hub at Indira Gandhi International Airport, New Delhi, alongside several focus cities across India. Air India is the largest international carrier out of India with an 18.6% market share. Over 60 international destinations are served by Air India across four continents. Additionally, the carrier is the third largest domestic airline in India in terms of passengers carried (after IndiGo and Jet Airways) with a market share of 13.5% as of July 2017. The airline became the 27th member of Star Alliance on 11 July 2014. 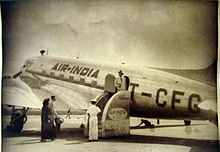 The airline was founded by J. R. D. Tata as Tata Airlines in 1932; Tata himself flew its first single-engine de Havilland Puss Moth, carrying air mail from Karachi to Bombay's Juhu aerodrome and later continuing to Madras (currently Chennai). After World War II, it became a public limited company and was renamed as Air India. On 21 February 1960, it took delivery of its first Boeing 707 named Gauri Shankar and became the first Asian airline to induct a jet aircraft in its fleet. In 2000–01, attempts were made to privatise Air India and from 2006 onwards, it suffered losses after its merger with Indian Airlines. Air India also operates flights to domestic and Asian destinations through its subsidiaries Alliance Air and Air India Express. Air India's mascot is the Maharajah (Emperor) and the logo consists of a flying swan with the wheel of Konark inside it. Air India had its origin as Tata Air Services later renamed to Tata Airlines  founded by J. R. D. Tata of Tata Sons, an Indian aviator and business tycoon. In April 1932, Tata won a contract to carry mail for Imperial Airways and the aviation department of Tata Sons was formed with two single-engine de Havilland Puss Moths. On 15 October 1932, Tata flew a Puss Moth carrying air mail from Karachi to Bombay (currently Mumbai) and the aircraft continued to Madras (currently Chennai) piloted by Nevill Vintcent, a former Royal Air Force pilot and friend of Tata. The airline fleet consisted of a Puss Moth aircraft and a de Havilland Leopard Moth. 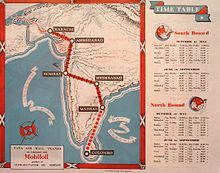 Initial service included weekly airmail service between Karachi and Madras via Ahmedabad and Bombay. In its first year of operation, the airline flew 160,000 miles (260,000 km), carrying 155 passengers and 9.72 tonnes (10.71 tons) of mail and made a profit of ₹60,000 (US$830). The airline launched its first domestic flight from Bombay to Trivandrum with a six-seater Miles Merlin. In 1938, it was re-christened as Tata Air Services and later as Tata Airlines. Colombo in Ceylon (now Sri Lanka) and Delhi were added to the destinations in 1938. During the Second World War, the airline helped the Royal Air Force with troop movements, shipping of supplies, rescue of refugees and maintenance of aircraft. After World War II, regular commercial service was restored in India and Tata Airlines became a public limited company on 29 July 1946 under the name Air India. After Indian independence in 1947, 49% of the airline was acquired by the Government of India in 1948. On 8 June 1948, a Lockheed Constellation L-749A named Malabar Princess (registered VT-CQP) took off from Bombay bound for London Heathrow marking the airline's first international flight. In 1953, the Government of India passed the Air Corporations Act and purchased a majority stake in the carrier from Tata Sons though its founder J. R. D. Tata would continue as Chairman till 1977. The company was renamed as Air India International Limited and the domestic services were transferred to Indian Airlines as a part of a restructuring. From 1948 to 1950, the airline introduced services to Nairobi in Kenya and to major European destinations Rome, Paris and Düsseldorf. The airline took delivery of its first Lockheed Constellation L-1049 and inaugurated services to Bangkok, Hong Kong, Tokyo and Singapore. On 21 February 1960, Air India International inducted its first Boeing 707–420, thereby becoming the first Asian airline to enter the Jet Age. The airline inaugurated services to New York on 14 May 1960. On 8 June 1962, the airline's name was officially truncated to Air India and on 11 June 1962, Air India became the world's first all-jet airline. In 1971, the airline took delivery of its first Boeing 747-200B named Emperor Ashoka (registered VT-EBD) and introduced a new Palace in the Sky livery and branding. In 1986, Air India took delivery of its first Airbus A310-300. In 1993, Air India took delivery of a Boeing 747-400 named Konark (registered VT-ESM) and operated the first non-stop flight between New York and Delhi. Air India joined the Star Alliance in 2014. Pictured is Air India Boeing 787 Dreamliner (VT-ANU) in special Star Alliance livery. In 2000–01, attempts were made to re-privatize Air India. In 2000, Air India introduced services to Shanghai, China. On 23 May 2001, the Ministry of Civil Aviation charged Michael Mascarenhas, the then-managing director, with corruption. According to the ministry reports, the airline lost approximately ₹570 million (US$7.9 million) because of extra commissions that Mascarenhas sanctioned and he was later suspended from the airline. In May 2004, Air India launched a wholly owned low cost subsidiary called Air-India Express connecting cities in India with the Middle East and Southeast Asia. Until 2007, Air India mainly operated on international long-haul routes while Indian Airlines operated on domestic and international short-haul routes. In 2007, Air India and Indian Airlines were merged under Air India Limited and the airline took delivery of its first Boeing 777 aircraft. The airline was invited to be a part of the Star Alliance in 2007. The combined losses for Air India and Indian Airlines in 2006–07 were ₹7.7 billion (US$110 million) and after the merger, it went up to ₹72 billion (US$1.0 billion) by March 2009. In July 2009, State Bank of India was appointed to prepare a road map for the recovery of the airline. The carrier sold three Airbus A300 and one Boeing 747-300M in March 2009 for $18.75 million to finance the debt. By March 2011, Air India had accumulated a debt of ₹426 billion (US$5.9 billion) and an operating loss of ₹220 billion (US$3.1 billion), and was seeking ₹429 billion (US$6.0 billion) from the government. A report by the Comptroller and Auditor General blamed the decision to buy 111 new aircraft and the ill-timed merger with Indian Airlines for the poor financial situation. In August 2011, the invitation to join Star Alliance was suspended as a result of its failure to meet the minimum standards for the membership. The government pumped ₹32 billion (US$450 million) into Air India in March 2012. On 1 March 2009, Air India made Frankfurt Airport its international hub for onward connections to the United States from India. However, the airline shut down the Frankfurt hub on 30 October 2010 because of high operating costs. In 2010, financially less lucrative routes were terminated and the airline planned to open a new hub for its international flights at Dubai. In 2012, a study commissioned by the Corporate Affairs Ministry recommended that Air India should be partly privatised. In May 2012, the carrier invited offers from banks to raise up $800 million via external commercial borrowing and bridge financing. In May 2012, the airline was fined $80,000 by the US Transportation Department for failing to post customer service and tarmac delay contingency plans on its website and adequately inform passengers about its optional fees. In 2013, the then-Civil Aviation Minister Ajit Singh stated privatisation was the key to the airline's survival. However, the opposition led by the BJP and the CPI(M) slammed the government. In 2013, the Indian government planned to delay equity infusion of ₹300 billion (US$4.2 billion) that was slated to be infused into the airline slowly over a period of eight years. In January 2013, Air India cleared a part of its pending dues through funds raised by selling and leasing back the newly acquired Boeing 787 Dreamliners. In March 2013, the airline posted its first positive EBITDA after almost six years and 20% growth in its operating revenue since the previous financial year. Air India Limited split its engineering and cargo businesses into two separate subsidiaries, Air India Engineering Services Limited (AIESL) and Air India Transport Services Limited (AITSL) in 2013. In December 2013, the airline appointed veteran pilot SPS Puri as its head of operations. The appointment was criticised by the Air India pilots union as Puri allegedly has multiple violations to his name. Air India became the 27th member of Star Alliance on 11 July 2014. In August 2015, it signed an agreement with Citibank and State Bank of India to raise $300 million in external commercial borrowing to meet working capital requirements. For FY 2014–15, its revenue, operating loss and net loss were ₹198 billion (US$2.8 billion), ₹2.171 billion (US$30 million) and ₹5.41 billion (US$75 million) compared FY 2011–12, which were ₹147 billion (US$2.0 billion), ₹5.138 billion (US$71 million) and ₹7.55 billion (US$110 million). As of May 2017, Air India is the third largest carrier in India (after IndiGo and Jet Airways), with a market share of 13%. On 28 June 2017, the Government of India announced the privatisation of Air India. A committee has been set up to start the process. Air India Limited is headquartered at the Indian Airlines House, New Delhi. Air India moved its headquarters from Air India Building, Mumbai to Delhi in 2013. 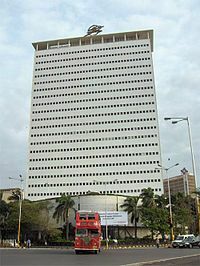 The former headquarters is a 23-storey tower on Marine Drive and was one of the targets of the 1993 Bombay bombings. Air India Regional was established as Alliance Air, a wholly owned subsidiary of Indian Airlines on 1 April 1996 and started operations on 21 June 1996. It was renamed Air India Regional after the merger between Air India and Indian Airlines. Air India Express began operations on 29 April 2005 and was initially owned by Air India Charters. It operates flights from South India to the Middle East and Southeast Asia. Air India became the first Asian airline to operate freighters when Air India Cargo was set up in 1954 and started its freighter operations with a Douglas DC-3 aircraft. Air India Cargo ended freighter aircraft operations in early 2012. 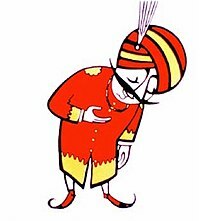 Air India's mascot is the Maharajah (high king). It was created by Bobby Kooka, the then-commercial director of Air India, and Umesh Rao, an artist with J. Walter Thompson Limited in 1946. Kooka stated that, "We call him a Maharajah for want of a better description. But his blood isn't blue. He may look like royalty, but he isn't royal". Air India adopted the Maharajah as its mascot in 1946. It was used in promoting it although initially designed only for the airline's memo-pads. The Maharajah was given a makeover in 2015 and the brand is represented by a younger version. Air India's colour scheme is red and white. The aircraft were painted in white with red palace style carvings on the outside of the windows and the airline's name written in red. The name is written in Hindi on the port side fuselage and in English on the port side tail. On the starboard side fuselage, the name is written in English, and in Hindi on the starboard tail. The window scheme was designed in line with the slogan Your Palace in the Sky. The aircraft were earlier named after Indian kings and landmarks. In 1989, to supplement its Flying Palace livery, Air India introduced a new livery that included a metallic gold spinning wheel on a deep red-coloured tail and a Boeing 747, Rajendra Chola, was the first aircraft to be painted in the new colours. The first logo of Air India was a centaur, a stylised version of Sagittarius shooting an arrow in a circle representing the wheel of Konark. The logo chosen by founder J. R. D. Tata was introduced in 1948 and represented the airline until 2007. On 22 May 2007, Air India and Indian Airlines unveiled their new livery consisting of a Flying Swan with the wheel of Konark placed inside it. The flying swan was morphed from the centaur logo and the chakra was derived from Indian's erstwhile logo. On 15 May 2007, Air India refreshed its livery, making the Rajasthani arches along the windows slightly smaller, extending a stylised line from the tail of the aircraft to the nose and painting the underbelly red. The new logo features on the tail and the engine covers with red and orange lines running parallel to each other from the front door to the rear door. As of March 2018, Air India flies to a total of 94 destinations including 54 domestic destinations and 40 international destinations in 28 countries across four continents around the world. Its primary hub is located at Indira Gandhi International Airport, New Delhi, and it has a secondary hub at Chhatrapati Shivaji International Airport, Mumbai. Air India became the 27th member of Star Alliance on 11 July 2014. In 1932, Air India started operations with a de Havilland Puss Moth. It inducted its first Boeing 707–420 named Gauri Shankar (registered VT-DJJ), thereby becoming the first Asian airline to induct a jet aircraft in its fleet and on 4 August 1993, Air India took the delivery of its first Boeing 747-400 named Konark (registered VT-ESM). Apart from the Boeing aircraft, Air India also operates a wide range of Airbus aircraft. In 1989, Indian Airlines introduced the Airbus A320-200 aircraft, which Air India now uses to operate both domestic and international short haul flights. In 2005, Indian Airlines introduced smaller A319s, which are now used mainly on domestic and regional routes. After the merger in 2007, Air India inducted the biggest member of the A320 family, the A321, to operate mainly on international short haul and medium haul routes. At the same time, Air India leased Airbus A330s to operate on medium-long haul international routes. Currently Air India has many narrow body aircraft for domestic destinations like A320, A321 and A320 neo. Air India has also many wide body aircraft like Boeing 777-200LR, Boeing 777-300ER, Boeing 747-400 and Boeing 787-8 mainly for international destinations. Air India Express, a subsidiary of Air India has a fleet of 23 Boeing 737-800. 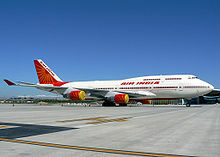 Air India One (also referred to as AI-1 or AIC001) is the call sign of any Air India aircraft carrying the Prime Minister, President or the Vice-President. Air India One operates on one of the five Boeing 747-400s that Air India currently owns as VIP flights. Customised Embraer 135 and Boeing Business Jets are also used. As a part of the financial restructuring, Air India sold five of its eight Boeing 777-200LR aircraft to Etihad Airways in December 2013. According to the airline, plans for introducing ultra-long flights with service to Seattle, San Francisco and Los Angeles were cancelled due to factors like high fuel prices and weak demand. Air India flights to Los Angeles and San Francisco have been resumed with more new international destinations. On 24 April 2014, Air India issued a tender for leasing 14 Airbus A320 aircraft for up to six years, to strengthen its domestic network. Air India has purchased many Boeing 787-8 dreamliners to strengthen international operations. Boeing 747-433M 2005 2008 One purchased from Air Canada. It was sold in 2008 and is currently in service with the Dubai Royal Air Wing. Apart from the aircraft listed above, Air India operated several other aircraft. Air India operated the de Havilland Puss Moth, de Havilland Fox Moth, Waco YQC-6, de Havilland Dragon Rapide, Percival Petrel, Douglas DC-2, Douglas DC-3, Vickers VC.1 Viking, Lockheed L-749 Constellation, Douglas DC-4 and the Lockheed L-1049 Super Constellation up to 1960. Thereafter, Air India started operating the Boeing 707 and the de Havilland Comet. The Boeing 777-200LR/777-300ER and Boeing 747-400 aircraft operated on long haul flights are in a three-class configuration. Boeing 787 Dreamliner and Airbus A321 aircraft have a two-class configuration. Airbus A320 aircraft operated on domestic- and short haul international flights are in either an all-economy configuration or a two-class configuration. Airbus A319 aircraft have a full economy configuration. Air India serves meals on all international flights and on domestic flights with a flight duration of over 90 minutes. Air India aircraft are equipped with Thales i3000 in-flight entertainment system. Passengers can choose from five channels airing Hindi and English content. Air India's Boeing 777, 747 and 787 aircraft are also equipped with personal on demand in-flight entertainment systems on which passengers can choose from available content. Showtime is the official entertainment guide published by Air India. Shubh Yatra (meaning Happy Journey) is a bilingual in-flight magazine published in English and Hindi by Air India. Flying Returns is Air India's frequent-flyer programme. It is shared by Air India and its subsidiaries. The points can be redeemed for awards travel on some other airlines. The airline entered the Guinness Book of World Records for the most people evacuated by civil airliner. Over 111,000 people were evacuated from Amman to Mumbai, a distance of 4,117 kilometres (2,558 mi), by operating 488 flights from 13 August to 11 October 1990 – lasting 59 days. The operation was carried out during Persian Gulf War to evacuate Indian expatriates from Kuwait and Iraq. The event was later featured in the film Airlift. On 27 December 1947, a Douglas DC-3 (registered VT-AUG) carrying nineteen passengers and four crew en route from Karachi to Bombay, crashed after take-off from Karachi International Airport due to an instrument failure, killing all on board. This was the airline's first fatal accident. On 3 November 1950, Air India Flight 245, a Lockheed L-749 Constellation (registered VT-CQP) carrying forty passengers and eight crew on a flight from Bombay to London via Cairo and Geneva, crashed on Mont Blanc in France killing all on board. On 13 December 1950, a Douglas DC-3 (registered VT-CFK) carrying 17 passengers and four crew from Bombay to Coimbatore, crashed into high ground near Kotagiri due to a navigational error, killing all on board. On 15 September 1951, Douglas DC-3 VT-CCA, carrying 23 passengers and four crew from Bangalore to Trivandrum, crashed on take-off, killing a crew member. On 9 May 1953, Douglas DC-3 registration VT-AUD crashed after take-off from Delhi killing all thirteen passengers and five crew on board. On 11 April 1955, a bomb exploded in the right main landing gear bay of a Lockheed L-749A Constellation registered VT-DEP, carrying eleven passengers and eight crew from Hong Kong to Jakarta. The right wing caught fire and the crew were forced to attempt a water landing. The wingtip dug into the water and the aircraft crashed, killing sixteen of the occupants. On 19 July 1959 Rani of Aera, a Lockheed L-1049G Super Constellation (registered VT-DIN) carrying 46 people (39 passengers and seven crew) crashed on approach to Santacruz Airport in conditions of poor visibility due to rain. The aircraft suffered damage beyond repair and was written off. There were no fatalities. On 24 January 1966, Air India Flight 101 Kanchenjunga, a Boeing 707–420 (registered VT-DMN) carrying 117 people (106 passengers and 11 crew) crashed on Mont Blanc, France killing all on board including the noted Indian scientist, Homi J. Bhabha. On 1 January 1978, Air India Flight 855 Emperor Ashoka, a Boeing 747-200B (registered VT-EBD) crashed into the Arabian Sea after take-off from Mumbai killing all 190 passengers and 23 crew on board. On 21 June 1982, Air India Flight 403, a Boeing 707–420 (registered VT-DJJ) carrying 99 passengers and 12 crew from Kuala Lumpur to Bombay via Madras crashed while landing at Sahar International Airport during a rainstorm. The fuselage broke apart and seventeen people including two crew members were killed. On 23 June 1985, Air India Flight 182, a Boeing 747-200B registered VT-EFO, was blown up in mid-air by a suitcase-bomb planted by Babbar Khalsa terrorists allegedly as revenge for the Indian Government's operation on the Golden Temple in June 1984. 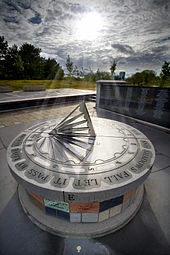 The flight was on the first leg on its Montreal-London-Delhi-Bombay flight when it exploded off the coast of Cork, Ireland in the Atlantic Ocean. All 307 passengers and 22 crew on board died. On 7 May 1990, Air India Flight 132, a Boeing 747-200B (registered VT-EBO) flying on the London-Delhi-Bombay route carrying 215 people (195 passengers and 20 crew) caught fire on touch down at Delhi airport due to a failure of an engine pylon-to-wing attachment. There were no fatalities but the aircraft was damaged beyond repair and written off. ^ a b "Air India". ch-aviation. Archived from the original on 17 January 2017. Retrieved 30 January 2017. ^ "7340.2F with Change 1 and Change 2 and Change 3" (PDF). Federal Aviation Administration. 15 September 2016. p. 3–1–11. Archived (PDF) from the original on 3 February 2017. Retrieved 30 January 2017. ^ a b c "Air India, Indian airline". Encyclopædia Britannica. Archived from the original on 12 March 2016. Retrieved 6 March 2016. ^ a b c Upadhyay, Anindya (15 February 2013). "Air India vacates Nariman Point; moves headquarters to Delhi". The Economic Times. Retrieved 16 February 2013. ^ Mahesh Langa (13 February 2019). "Ashwani Lohani appointed Air India CMD for second time". The Hindu. Retrieved 15 February 2019. ^ a b "STATEMENT OF PROFIT AND LOSS FOR THE YEAR ENDED 31ST MARCH 2017" (PDF). Official Website of Air India. Retrieved 7 May 2018. ^ "Air India records 11% revenue growth in 2017-18". New Delhi: The Hindu. PTI. 12 April 2018. Retrieved 7 May 2018. ^ "Flying low; India's flag carrier is in big trouble". The Economist. 21 July 2012. Archived from the original on 23 June 2016. Retrieved 15 October 2016. ^ "Air traffic soars 15% in April; Indigo stays on top; Air India marketshare flat at 12.9%". The Financial Express. 19 May 2017. Archived from the original on 6 August 2017. Retrieved 24 October 2017. ^ "Air India : The History of The Aircraft Fleet". airwhiners.net. Archived from the original on 24 July 2016. Retrieved 15 July 2016. ^ "Tata Airlines to Air India: Is the Maharajah set for a home flight?". The Indian Express. 22 June 2017. Archived from the original on 28 July 2017. Retrieved 24 October 2017. ^ "Airline Companies of the World". Flight International. 27 April 1939. Archived from the original on 8 October 2013. Retrieved 17 September 2011. ^ a b c d "How Maharaja got his wings". Tata Sons. Archived from the original on 4 June 2016. Retrieved 7 March 2016. ^ Seth, Pran Nath; Bhat, Sushma Seth (2005). An introduction to travel and tourism. Sterling Publishers. ISBN 978-81-207-2482-2. ^ Behari, Bapu (1996). Astrological Biographies: Seventeen Examples of Predictive Insights. Motilal Banarsidass. ISBN 978-81-208-1322-9. ^ "Switzerland Schweiz Suisse Svizzera". Air India. Archived from the original on 11 August 2012. Retrieved 13 September 2012. ^ Subramanian, Samanth (15 October 2012). "When Air India Was Efficient, Profitable and Growing Fast". The New York Times. Archived from the original on 3 April 2013. Retrieved 24 March 2013. ^ "Humane Face of IAF: Aid to the Civil Administration" (PDF). Medind.nic.in. Archived (PDF) from the original on 30 January 2016. Retrieved 1 October 2012. ^ Air Transport Inquiry Committee (1950). Report of the Air Transport Inquiry Committee, 1950. University of California. p. 28. ^ "Tatas history". Archived from the original on 29 July 2017. Retrieved 28 July 2017. ^ "Air India: Air India was at its peak during the JRD Tata times: Jitendra Bhargava, Former ED, Air India - The Economic Times". Economictimes.indiatimes.com. 21 June 2017. Archived from the original on 29 July 2017. Retrieved 24 October 2017. ^ "Air Corporations Act, 1953" (PDF). Government of India. DGCA. Archived (PDF) from the original on 1 January 2018. Retrieved 6 March 2016. ^ a b c d e f g h i j "Timeline: Air India". Air India. Archived from the original on 3 April 2014. Retrieved 2 April 2014. ^ Sabharwal, Gopa (2007). India Since 1947: The Independent Years. Penguin India. p. 77. ISBN 978-0-14-310274-8. ^ a b Sean Mendis. "Air India : The history of the aircraft fleet". Archived from the original on 15 March 2014. Retrieved 2 April 2014. ^ a b "Theory on Air India Crash Backed by a Pilot". The New York Times. 21 April 1985. Archived from the original on 5 March 2016. Retrieved 6 March 2016. ^ Jethmalani, Ram. "The dying Maharaja's last sigh". Sunday Guardian. Archived from the original on 9 October 2016. Retrieved 6 March 2016. ^ "India privatisation plans near 'collapse'". BBC. 3 September 2001. Archived from the original on 17 September 2009. Retrieved 23 April 2010. ^ "Tata still eyeing Air India". BBC. 3 September 2001. Archived from the original on 7 March 2016. Retrieved 6 March 2016. ^ "Singapore Airlines pulls out". The Hindu. 2 September 2001. Archived from the original on 13 December 2013. Retrieved 6 March 2016. ^ Timmons, Heather (25 May 2011). "Criticism of State-Owned Air India Grows". The New York Times. Archived from the original on 29 May 2011. Retrieved 20 May 2012. ^ Katakam, Anupama (21 April 2014). "Controversy in the air". Frontline. Archived from the original on 3 March 2018. Retrieved 6 March 2016. ^ "National Aviation Company of India Limited" (PDF). Air India. Archived from the original (PDF) on 20 April 2013. Retrieved 18 February 2013. ^ "Star Alliance invites Air India to join". The Economic Times. 13 December 2007. Retrieved 23 March 2014. ^ "What sent Air India crashing?". The Economic Times. 16 July 2009. Archived from the original on 19 July 2009. Retrieved 30 August 2010. ^ "Air India restructuring plans being readied". The Hindu. Chennai, India. 9 July 2009. Archived from the original on 28 April 2010. Retrieved 30 August 2010. ^ "SBI Caps prepares roadmap for Air India restructuring". DNA India. 22 July 2009. Archived from the original on 23 February 2010. Retrieved 30 August 2010. ^ "AI sells 4 aircraft in Mar to tackle financial crunch". The Financial Express. 29 July 2009. Archived from the original on 16 August 2009. Retrieved 30 August 2010. ^ "Air India's recurring default 'credit negative' for its banks". Mint-Wall Street Journal. 9 August 2011. ^ "State Bank of India Credit Rating". Moodys.com. Archived from the original on 20 June 2012. Retrieved 1 October 2012. ^ "Air India aircraft acquisition was necessary". Malayala Manorama. 8 September 2011. Archived from the original on 8 March 2016. Retrieved 6 March 2016. ^ Choudhury, Santanu (8 September 2011). "Auditor Slams Air India Plane Orders". The Wall Street Journal. Archived from the original on 17 March 2016. Retrieved 6 March 2016. ^ "Star Alliance and Air India put Air India's Alliance Membership Application on hold" (PDF) (Press release). Star Alliance. 31 August 2011. Archived from the original (PDF) on 28 March 2012. Retrieved 31 August 2011. ^ "Air India, Star Alliance resume talks". Hindustan Times. 13 October 2011. Archived from the original on 16 December 2011. Retrieved 15 October 2011. ^ Sundaram, Karthikeyan; Narayan, Adi (14 March 2012). "Air India Aid Dwarfing Hospital Budget Adds to Kingfisher Pain". Bloomberg. Archived from the original on 2 February 2014. ^ "Air India: Problems run deep in India's national airline". BBC. 16 May 2012. Archived from the original on 31 January 2016. Retrieved 6 March 2016. ^ "Air India to use Terminal-3 as hub of operations". NDTV. 14 July 2010. Archived from the original on 18 July 2010. Retrieved 12 August 2010. ^ "Dubai in talks over hub". The National. Abu Dhabi. Archived from the original on 24 November 2015. Retrieved 5 November 2015. ^ "Air India should be partly privatised, says study". The Economic Times. 30 September 2012. Retrieved 6 March 2016. ^ Reuters (8 May 2012). "Air India seeks proposals to raise up to $800 million in debt". The Economic Times. Archived from the original on 4 March 2016. Retrieved 6 March 2016. ^ "$80,000 Fine Slapped on Air India by US". Outlook. 4 May 2012. Archived from the original on 2 February 2014. Retrieved 6 March 2016. ^ "Air India must perform or perish: Civil Aviation Minister Ajit Singh". NDTV. 6 October 2013. Archived from the original on 7 April 2014. Retrieved 6 March 2016. ^ Mehdudia, Sujay (7 October 2013). "Opposition slams Ajit Singh for AI plan". The Hindu. Chennai, India. Archived from the original on 13 February 2014. Retrieved 6 March 2016. ^ "Debt laden Air India unlikely to get government bailout of Rs 30,000 crore by 2020–21". The Economic Times. 11 February 2013. Archived from the original on 23 August 2017. Retrieved 11 February 2013. ^ "GMR Infra gets Rs 415 cr in outstanding dues from Air India". Business Today. 7 February 2013. Archived from the original on 12 February 2013. Retrieved 8 February 2013. ^ "Air India puts Dreamliner planes for sale, leaseback". The Economic Times. 28 January 2013. Archived from the original on 23 August 2017. Retrieved 28 January 2013. ^ "Air India likely to end fiscal with Rs 65 crore positive EBITDA". The Economic Times. 10 March 2013. Retrieved 6 March 2016. ^ "Significant improvements in Air India's performance parameters". The Economic Times. 1 April 2014. Retrieved 4 April 2014. ^ "Air India engineers threaten to drag management to court". Deccan Chronicle. Archived from the original on 30 January 2016. Retrieved 6 December 2015. ^ "Companies – Air India". Live Mint. Archived from the original on 11 December 2015. Retrieved 7 December 2015. ^ Singh, Bipin Kumar (20 December 2013). "Air India appoints 'biggest violator' as its operational head, pilots furious". The Times of India. Archived from the original on 20 December 2013. Retrieved 21 April 2014. ^ a b Young, Kathryn M. (25 June 2014). "Air India to join Star Alliance July 11 | Finance & Data content from". ATWOnline. Archived from the original on 15 July 2014. Retrieved 6 August 2014. ^ a b "Air India to join Star Alliance in 2014". Star Alliance. Archived from the original on 16 December 2013. Retrieved 23 March 2014. ^ "Can Ashwani Lohani turn Air India around?". Business Standard. 14 September 2015. Archived from the original on 4 December 2015. Retrieved 6 December 2015. ^ "Air India likely to suffer 2636 crore net loss in 2015–16". 28 April 2016. Archived from the original on 18 October 2016. Retrieved 16 October 2016. ^ "Significant improvements in Air India's performance parameters". NDTV. 27 July 2015. Archived from the original on 4 March 2016. Retrieved 6 March 2016. ^ "India's domestic passenger demand up 25 percent: IATA". Business Standard. 6 April 2014. Archived from the original on 23 April 2016. Retrieved 14 April 2016. ^ "Air India market share slips to fifth slot". The Economic Times. New Delhi. 24 June 2011. Retrieved 1 October 2012. ^ Kumar, Nirbhay (16 November 2007). "Spice, IndiGo close in on Jet, Air India market share". The Economic Times. New Delhi. Archived from the original on 16 June 2012. Retrieved 1 October 2012. ^ "IndiGo market share shrinks for 2nd month in a row in December". The Times of India. 21 January 2014. Retrieved 4 April 2014. ^ "Air India cleared for privatisation by Delhi - BBC News". Bbc.com. Archived from the original on 23 August 2017. Retrieved 24 October 2017. ^ "Air India, Board of directors". Air India. Archived from the original on 30 October 2015. Retrieved 4 November 2015. ^ "Bombay hit by devastating bombs". BBC. 12 March 1993. Archived from the original on 11 December 2008. Retrieved 3 September 2011. ^ "Air India Regional". Air India. Archived from the original on 9 January 2015. Retrieved 29 December 2014. ^ Ramavarman, T. (14 December 2012). "Shifting of Air India Express headquarters to Kochi gets nod". The Times of India. Retrieved 5 February 2013. ^ "Air India Express route scheduling". The Hindu. 7 January 2013. Archived from the original on 11 January 2013. Retrieved 5 February 2013. ^ Singh, Sanjay (7 January 2012). "Air India shuts down bleeding cargo business". Business Today. New Delhi. Retrieved 6 March 2016. ^ "The Wonderful Journey of Air India's Maharajah". The Times of India. 6 September 2014. Archived from the original on 30 January 2016. Retrieved 6 March 2016. ^ a b "Air India Brand". Air India. Archived from the original on 4 November 2015. Retrieved 4 November 2015. ^ Sinha, Saurabh (18 January 2015). "Maharajah, gets a makeover". The Times of India. Archived from the original on 10 December 2015. Retrieved 6 December 2015. ^ "PM Modi reportedly wants Air India's mascot, The Maharajah, replaced by a plebeian one". The Times of India. 24 June 2014. Archived from the original on 23 January 2015. Retrieved 6 December 2015. ^ rao, Sunil (15 May 2005). "When did the Maharaja become Air-India's mascot". The Times of India. Archived from the original on 3 March 2018. Retrieved 6 December 2015. ^ "Maharajah gets a makeover". The Times of India. 18 January 2015. Archived from the original on 10 December 2015. Retrieved 6 March 2016. ^ "Air India:History". airwhiners.net. Archived from the original on 23 September 2015. Retrieved 5 November 2015. ^ "Airlines logos with colors". spellbrand.com. Archived from the original on 24 November 2015. Retrieved 5 November 2015. ^ "Air India to get a new logo". Flightglobal. 23 May 2007. Archived from the original on 23 November 2015. Retrieved 4 November 2015. ^ "Time table, Air India". Air India. Archived from the original on 5 March 2016. Retrieved 6 March 2016. ^ Kumar, Akshay (1 October 2015). "Air India to develop Mumbai as its secondary hub". The Financial Express. Archived from the original on 25 October 2015. Retrieved 3 June 2016. ^ "Profile on Air India". CAPA. Centre for Aviation. Archived from the original on 30 October 2016. Retrieved 30 October 2016. ^ "Air India / TAP Air Portugal begins codeshare service from March 2018". Airlineroute. Retrieved 16 March 2018. ^ "Fleet Details". Air India. Archived from the original on 27 February 2019. Retrieved 27 February 2019. ^ "Air India to get 23rd Dreamliner in January, last 4 planes by March 2017". Business Standard. Business Standard Private Ltd. Press Trust of India. 4 December 2016. Archived from the original on 5 December 2016. Retrieved 7 December 2016. ^ "Air India to opt for business economy class seats in A320 neos". The Economic Times. 7 March 2016. Archived from the original on 10 March 2016. Retrieved 7 March 2016. ^ "VT-ESM Air India Boeing 747–437". PlaneSpotters. Archived from the original on 27 May 2013. Retrieved 11 February 2013. ^ "Air India One, Seat No 59G". The Indian Express. 26 September 2010. Archived from the original on 13 January 2011. Retrieved 9 April 2011. ^ "Manmohan Singh to travel in Air India One Agra". Topnews.in. 26 September 2010. Retrieved 9 April 2011. ^ "April 1 date for President with business jets". Zee News. 16 March 2009. Archived from the original on 23 May 2012. Retrieved 8 April 2011. ^ "India's own Air Force One takes to the skies". The Hindu. Chennai, India. 1 April 2009. Archived from the original on 26 September 2011. Retrieved 9 April 2011. ^ "VVIPs get their special jets". The Financial Express. 21 September 2005. Archived from the original on 20 May 2013. Retrieved 8 April 2011. ^ PTI (7 December 2013). "Air India firms up deal to sell five Boeing 777 to Etihad". The Hindu. Archived from the original on 13 December 2013. Retrieved 25 April 2014. ^ "Air India seeks to lease 14 Airbus A320 aircraft". Reuters. 24 April 2014. Archived from the original on 26 April 2014. Retrieved 25 April 2014. ^ "REGISTRATION DETAILS FOR VT-AIM (AIR INDIA) 747-433". PlaneLogger. Retrieved 27 November 2018. ^ "Air India 1951–1960". Air India. Archived from the original on 12 March 2013. Retrieved 7 February 2013. ^ "Seat Map, Air India Boeing 777-300 ER". seatguru.com. Archived from the original on 31 October 2015. Retrieved 4 November 2015. ^ "Seat Map, Air India Boeing 747-400". seatguru.com. Archived from the original on 26 October 2015. Retrieved 4 November 2015. ^ "Seat Map, Air India Boeing 787". seatguru.com. Archived from the original on 26 October 2015. Retrieved 4 November 2015. ^ "Seat Map, Air India Airbus A321". seatguru.com. Archived from the original on 3 November 2015. Retrieved 4 November 2015. ^ "Seat Map, Air India Airbus A320 V1". seatguru.com. Archived from the original on 18 November 2015. Retrieved 4 November 2015. ^ "Seat Map, Air India Airbus A320 V2". seatguru.com. Archived from the original on 7 November 2015. Retrieved 4 November 2015. ^ "Seat Map, Air India Airbus A319". seatguru.com. Retrieved 4 November 2015. ^ Jha, Somesh (26 December 2015). "Air India says non-veg food was never served on short duration flights". The Hindu. Archived from the original on 21 December 2016. Retrieved 6 March 2016. ^ "Air India in-flight entertainment guide" (PDF). Air India. Archived (PDF) from the original on 27 March 2016. Retrieved 6 March 2016. ^ "Showtime" (PDF). Air India. Archived from the original (PDF) on 24 February 2013. Retrieved 29 January 2013. ^ "Air India to now have a new in-flight bi-lingual magazine". The Economic Times. 8 February 2013. Archived from the original on 23 August 2017. Retrieved 9 February 2013. ^ "About Flying Returns". Air India. Archived from the original on 29 September 2013. Retrieved 29 January 2013. ^ "Flying Returns – Maharajah Club". Flyingreturns.co.in. Archived from the original on 25 April 2012. Retrieved 1 October 2012. 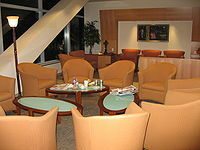 ^ "Airport lounges". Air India. Archived from the original on 10 March 2016. Retrieved 6 March 2016. ^ a b "Air India, History of Air India, Air India Flight Services, Air India International, Passenger Operations, Awards in Air India". Thisismyindia.com. Archived from the original on 31 December 2009. Retrieved 10 June 2010. ^ Venkataramakrishnan, Rohan. "The Berlin airlift was remarkable, but the largest civilian evacuation in history is by India". Scroll.in. Archived from the original on 16 April 2015. Retrieved 11 April 2015. ^ "Did You Know That The Largest Air Evacuation in History Was Done By India?". The Better India. Archived from the original on 5 March 2016. Retrieved 6 March 2016. ^ "Airlift: Akshay Kumar's next a thriller of the biggest human evacuation". The Times of India. Archived from the original on 11 January 2016. Retrieved 19 December 2012. ^ "Mathunny Mathews, the Real-life Hero of 'Airlift', Dies in Kuwait". News 18. 21 May 2017. ^ "ASN Aircraft accident Douglas C-48C-DO (DC-3) VT-AUG". Aviation-safety.net. Archived from the original on 23 November 2015. Retrieved 12 September 2015. ^ "Malabar Princess". Archived from the original on 20 July 2011. Retrieved 17 June 2009. ^ "The 'Malabar Princess' Catastrophe". Archived from the original on 20 June 2009. Retrieved 17 June 2009. ^ "ASN Aircraft accident Douglas C-48C-DO (DC-3) VT-CFK". Aviation-safety.net. Archived from the original on 23 November 2015. Retrieved 13 September 2015. ^ "ASN Aircraft accident Douglas C-47A-30-DK Dakota III VT-CCA Bangalore-Hindustan Airport (BLR)". Aviation-safety.net. Archived from the original on 23 November 2015. Retrieved 13 September 2015. ^ "ASN Aircraft accident VT-AUD". Aviation-safety.net. Archived from the original on 19 October 2015. Retrieved 28 October 2015. ^ "ASN Aircraft accident Lockheed L-749A Constellation VT-DEP Great Natuna Islands". aviation-safety.net. Archived from the original on 25 August 2009. Retrieved 10 June 2010. ^ "Déjà vu from 30,000 ft". The Times of India. 4 January 2015. Archived from the original on 7 June 2016. Retrieved 6 March 2016. ^ "Diplomatic post bag from 1966 Indian plane crash found on Mont Blanc". The Daily Telegraph. 22 August 2012. Archived from the original on 3 December 2013. Retrieved 28 November 2013. ^ "Accident Database: Accident Synopsis 06221982". Airdisaster.com. 22 June 1982. Archived from the original on 11 August 2010. Retrieved 30 August 2010. ^ "Fatal Events Since 1970 for Air India". Airsafe.com. Archived from the original on 23 February 2010. Retrieved 30 August 2010. ^ "Indepth: Air India". CBC News. Archived from the original on 6 May 2007. Retrieved 8 May 2007. ^ "ASN Aircraft accident Boeing 747-237B VT-EBO Delhi-Indira Gandhi International Airport (DEL)". Aviation-safety.net. Archived from the original on 22 August 2009. Retrieved 10 June 2010. Wikimedia Commons has media related to Air India.